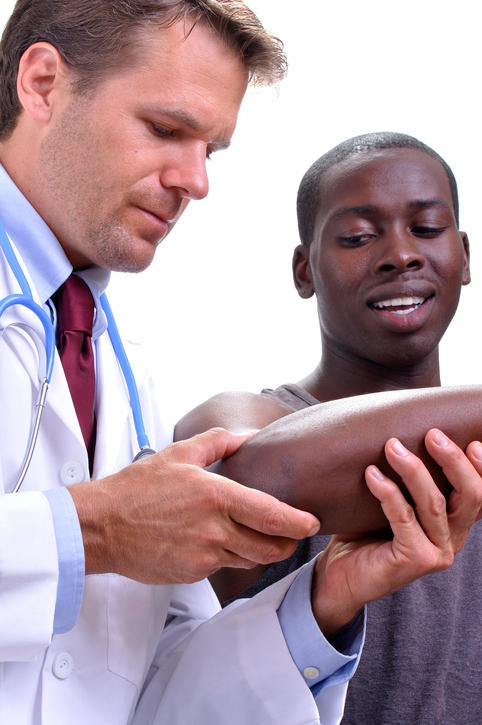 At The Orthopedic Clinic, we individualize the treatment plan to your needs to provide the best care possible for you. Our goal is always to provide treatment that balances the fastest recovery possible with our patients’ overall health and well-being. At The Orthopedic Clinic, we give our patients the ability to live their very best life in full motion. We approach elbow care with this mindset, customizing our treatment plan to you. Why? Because we believe this is how to provide the best care possible. And that’s what you deserve. The elbow is crucial in rotating the forearm and giving power to the upper body. It consists of three bones: the humerus, radius, and ulna. The radius and ulna are two slightly curved bones that make up the forearm. The end of your humerus has two main bony parts, which you can feel these at the sides of your elbow. These are the lateral epicondyle and medial epicondyle. The muscles that attach to the lateral epicondyle helps you straighten and extend your wrist and fingers. The muscles that attach to the medial epicondyle helps flex your wrist and fingers, which allows you to grasp objects. Finally, your ulnar nerve, which wraps around the medial epicondyle, innervates (supplies with nerves) the muscles of the hand that allow for fine motor activity. We insert a small camera into the elbow through small incisions. This helps us diagnose and treat conditions such as arthritis, stiffness, and cartilage defects. This minimally-invasive approach reduces soft tissue dissection, leading to a faster recovery with fewer complications. Total elbow replacement treats elbow arthritis by replacing the damaged parts of the elbow joint with artificial components. The artificial joint is made up of a metal and plastic hinge with two metal stems that fit inside the hollow part of the bone canal. Patients experience resolution of their pain and improved elbow motion and function. 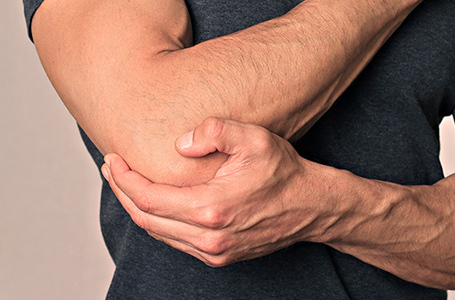 Cubital tunnel release is a procedure that decompresses the nerve at the elbow by releasing the overlying soft tissue and potentially moving the nerve out of the cubital tunnel. This resolves the hand numbness and elbow pain commonly associated with the condition. Initial management of tennis elbow and golfer’s elbow involves non-surgical options like splinting, injections, and physical therapy. If this approach fails to relieve pain, surgery may be considered. A small incision is made at the side of the elbow. The diseased tissue is removed and the tendons are repaired to reduce pain and improve mobility. Biceps and triceps tendon repair involves re-attaching the torn biceps or triceps tendon to the bone using small metal implants. We use an innovative single-incision technique that helps reduce complications and leads to a faster recovery. Our team of trusted and respectful orthopedic specialists can help you! We can help you determine the source of your pain to create a custom treatment plan for your needs, so you can get back to the things you love to do.